The Bohol Provincial Road Network Development Plan (PRNDP) is an integrated five-year (2011-2015) plan for the sustainable development and management of road networks in the province. It is a component of the Provincial Roads Management Facility (PRMF), an initiative of the Australian Agency for International Development (AusAID) in partnership with the Department of Interior and Local Government (DILG) which seeks institutional reforms and governance with the road sector as an entry point. The PRNDP is a planning tool that supports the efforts of provincial governments to increase economic activities and improve public access to infrastructure and services. 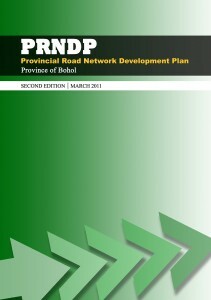 A sustainable development of the road network is facilitated by prioritizing road development activities over a rolling five-year period through a participatory process, involving various community stakeholders from the private and business sectors, national government agencies as well as key provincial government departments and offices. It targets rehabilitation and sustainable maintenance of provincial roads on an annual basis and is supported by multi-year budgeting and expenditure management, underpinned by a capacity building program to improve skills, processes and systems in road development and management. Every year, the PRNDP is updated to assess performance of the previous year’s plan and to update data on road conditions, the core road network and investment priorities as basis for strategic action and budgeting. It is also to reflect capacity development priorities for the next five years. By having a PRNDP, the Provincial Government is in a better position to sustain and improve the existing road network through investment planning and budgeting, systems improvement, human resource development, and involvement of communities who are affected as the roads’ hosts and end-users. The PRNDP review and updating process also develops systematic, repeatable and transparent selection processes for prioritizing road investment that involves stakeholder and community consultation. Further, it institutionalizes road rehabilitation and maintenance as a critical service of the Provincial Government so that the road network is maintained in optimal condition to bring socio-economic benefits to its constituents. 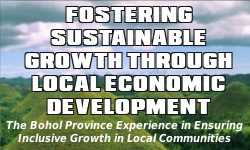 The objectives of the Provincial Development and Physical Framework Plan (PDPFP) which sets out the strategic directions for development within the Province. The PRNDP will support the attainment of the goals and objectives in the PDPFP by developing the road transport network according to Provincial development priorities. The goals and objectives of the PRMF which aim to increase local economic activity and improve public access to infrastructure and services. The Provincial Road Sector Planning and Management Review (PRSPMR) which identifies gaps in capacity for the Provincial Government to support and underpin the requirements of sustaining a road network development program, including maintenance and rehabilitation. This examines planning, budgeting, skills, systems, linkages and services required to perform the necessary functions. The current condition and performance of the road network and road development activities occurring at the national and local levels, including those being developed with the assistance of other donors (also included as part of the PRSPMR). The available funds for new road works, road rehabilitation and road maintenance, including bridge construction and supporting infrastructure. Download the document plan from the links below. Good day. Does your good office have the updated PRNDP? I understand that the PRNDP is updated annually to evaluate and update progress in the transportation sector. Thank you! According to the people in-charge, they are yet on the early stage of the process of updating the PNRDP.